If the app is installed in Personal mode you can enable various security features from within the Settings area found on the login screen which is accessible via the cog icon. A standard passcode (4 digit pin) or complex passcode (5 or more characters) can be configured. By default the pin will be requested the when the app is first launched. If the app is backgrounded you will NOT be prompted for the pin. Only if the app is completely closed (double tap home button and swipe the app up) will you be prompted for the passcode. If you want the app to always prompt for your security details when it is opened (even when backgrounded) select Lock On Wake. 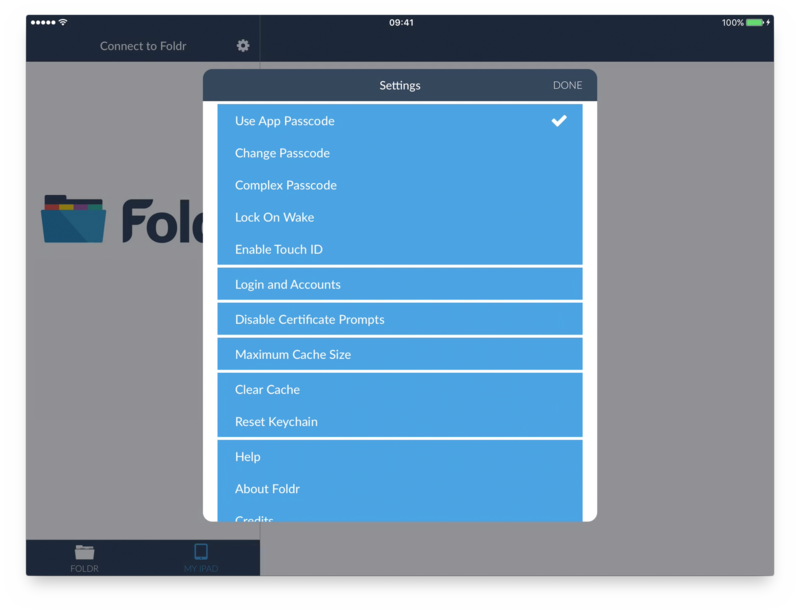 You can also use Touch ID on compatible devices to unlock the Foldr app with your fingerprint. Note – if you forget your passcode you must remove and reinstall the app to remove it.